New buildings are going up all over downtown Columbus, and I’ve been hoping that we’ll be getting some new restaurants along with the new office and residential space. So when I saw that The Goat was open for business — even though the building it occupies is still seriously under construction — the Jersey Girl, the Origamist, and I decided to stroll down South High Street and pay it a visit. Although the space surrounding the restaurant is a beehive of construction workers, scaffolding, and other equipment, the interior space at The Goat is finished and very pleasant, with high ceilings, an open, airy feeling, and lots of room between the tables and chairs. It’s reminiscent of a New York or LA bistro. The only downside we noted is that there were TVs everywhere, with the sound on, which was distracting while we were trying to carry on a conversation. I think there are too many TVs in America, period, but unless a restaurant intends to be a sports fan hangout — and the menu at The Goat doesn’t suggest that is the business model — it’s got to limit the idiot boxes to the immediate bar area. If I were running The Goat, I’d follow that approach and ditch a lot of the TVs. As it is, the place seems to be neither fish nor fowl. As for the food, the menu is limited, but interesting. I got the buffalo chicken wrap, which came with some very tasty fries. The chicken was very tender and flavorful, and the wrap made for a substantial meal. 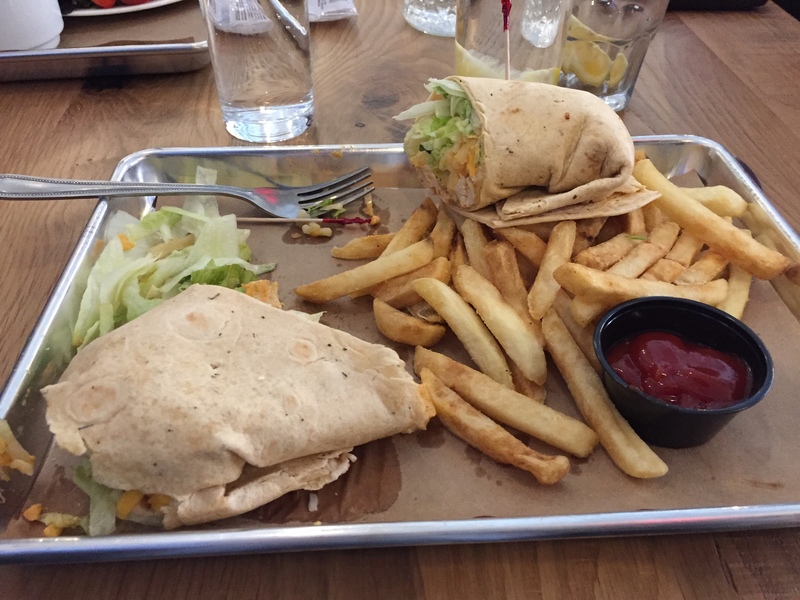 The only downside was that the wrap was chock full of iceberg lettuce, even though there was no mention of lettuce in the description of the dish on the menu. This is another pet peeve of mine — a menu should disclose all ingredients in a dish, and diners should be entitled to rely on finding only what is listed when their order comes. I hate iceberg lettuce, so I used the fork to shovel as much of it as possible out of the wrap. Without the lettuce, the wrap was very good. The Jersey Girl raved about her soup, and the Origamist liked her wrap, too. I’ll go back to The Goat, which is a pretty nice setting for lunch, but I’d like it even better with fewer TVs and more information on the menu.